We have been working hard to improve the ORD experience for our customers. Through both self-evaluation and several user-provided suggestions, we have identified areas for improvement. We are happy to let you know that three big improvements are completed and waiting for our customers to experience. Thank you to all of our customers who have provided us with valuable feedback! Website Performance – We will not bother you with the nerdy technical details, but you will notice that our site runs much faster now. Whether you are shopping for printed materials or accessing your Monthly Graphics, you will notice the smoother operation. This is an effort on which we continue to work so we plan even further improvements in this area. Improved Shipping Service – FedEx is now our official shipping carrier! Customers can expect faster shipping and more accurate and descriptive tracking details for their packages. In addition, our shipping schedule has changed slightly. For orders that are placed before 12pm Central Time, we will ship your order on the same day as it was received Monday through Friday. Any orders that are placed after 12pm CT Friday through Sunday will be shipped the following Monday. 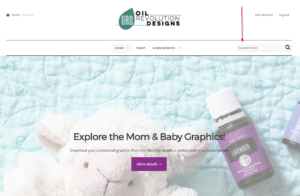 Graphic Search Function – If you are seeking a graphic that pertains to a specific Young Living product, product application, season, or usage you can find them using our new gallery search function. It appears in the upper right corner of our site. Please note that search results will include galleries that are only available to active subscribers so you must be logged in to view those results. Some example queries include: Lavender, Beyond the Kit, Christmas, Beauty, etc.